(Newser) – John Boehner moved to lop one head off of Washington's two-headed fiscal crisis today, announcing that House GOP leadership would agree to pass a short-term debt ceiling increase—while continuing to push for concessions from Democrats to end the government shutdown. 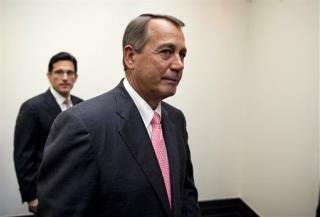 "We can't fight on two fronts," Boehner told his troops in a meeting this morning, Politico reports. Indeed, the only thing Boehner is demanding in exchange for the debt increase is that the House and Senate appoint conferees to work on a budget deal. Lets just hope Obama holds his ground. This man looks more and more to go down in History as a great, strong, intelligent leader. His common sense & excellent decision making all while fighting the powerful, political, wealthy, self serving scabs that put capitalism above patriotism & unity has been right on. He is far and above better then the last 8 Presidents before him. America is showing signs of getting back some world wide respect. Much to the haters dislike, this man deserves a big portion of the credit. While I realize that SOME of the current dispute is over ACA, It's too bad the GOP has to resort to tactics like this in an effort to try to get Oblama & Reed to do what they are constitutionally suppose to be doing. Instead of accepting the runaway debt, the up escalator like debt ceiling limits, and continuing the unchecked spending why aren't BOTH parties working together to CUT spending in an effort to balance our national budget and bring our financial house in order? While BOTH parties are guilty of adding their favorite pork programs to spending bills the Democrats seem to do it best and are currently in charge of two branches of the federal government. So if blame is to be placed Dems should get at least 2/3 of the credit! Boehner is tired and wants to take a 6 week break from holding the US economy hostage... so he can resume his extortion-terroristic activities just before Thanksgiving. FYou Boehner and anybody who's insane enough to support you.